This case study, written in May 2018, describes years three and four of an organizational department’s Agile journey. Written from the perspective of one of its leaders, it describes the kind of support Gil provided and the results the department achieved. We are the Digital Products department of a major corporation. Our 120 employees develop and maintain multiple Web assets used by millions of people. We need to keep up with the rapid advances in the digital space and to support the objectives of our many stakeholders; in short, we are critical for keeping our corporation relevant. After years of traditional project management, we ran a pilot project using Scrum, and based on its success, we launched a Scrum-based Agile transformation in early 2014. The first two years yielded mixed results. While teams seemed more productive and responsive than before, collaboration across product teams was lacking; team decision-making was ineffective and inefficient; and overall employee engagement was low. In March 2016, two years after we began the transformation, management started the next leg of the journey – the cultural leg. We believed that grounding the transformation in authentic values and true empowerment would increase the department’s engagement, effectiveness, and productivity. To help us do that, we engaged 3P Vantage’s Gil Broza. “What does Agile mean to us?” This management meeting resulted in the elicitation of the department’s three core values: Collaborate, Learn, and Improve. Since then, these values have informed how teams approach their work, how they interact with other teams, and how Digital Products approaches hiring and onboarding. “What’s the role of management and their success criteria?” This meeting increased management’s commitment to cultivating a collaborative environment. Following the initial workshops, Gil visited the department for one or two days a month to support management, team leads, and entire teams. In some of his visits, he coached and/or led large-scale meetings about preparing for growth, roadmapping, and strategic planning. The rest of his time on site he coached team leads and product managers on making Agile-minded choices. Every few months, Gil ran an additional session of “Being Agile” for new employees as part of the onboarding process. Our laser focus on our culture and the value of large group wisdom led us to invest in our facilitation and leadership capabilities. We redesigned the ScrumMaster role as a people-before-process role called the Agile Team Leader (ATL). More and more, managers stepped into servant leadership and focused on the system, rather than management of work. In late 2017, we shifted functional managers into team management, so they now had responsibility for entire teams as opposed to only developers or only testers. All managers, product managers and ATLs received training in professional group facilitation methods. We made facilitation an integral part of our meeting culture, using it in regular operations, innovation, and continuous improvement activities. Team members, who had considered the Agile meetings boring and a waste of time, engaged more and more. A one-day workshop in December 2016 with the focus question, “Next calendar year, we’ll be 40% bigger and achieve more. What can we do to meet these challenges and opportunities?” The meeting (shown in the picture) was modeled on the Open Space format. 56 people, hailing from all parts and roles in the department, accepted the open invitation. Management committed to seriously consider every proposal that received consensus in the event. All attendees engaged fully throughout the day, and many of their ideas were later enacted. The event marked a turning point in staff engagement. A one-day workshop in May 2017 including about 40 senior managers and stakeholders to create a plan for the fiscal year that makes sense to everyone. The plan highlighted dependencies and the criticality of cross-team collaboration and prioritization. Stakeholders remarked favourably on the experience, some of them seeing for the first time the full picture of the department’s workload. A half-day workshop in June 2017 pursuing partnership between Digital Products and the infrastructure team. 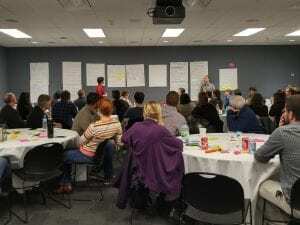 15 managers and key participants from both groups attended and worked through the question, “How can we work better together?” This meeting improved relationships, which had previously been strained. “How should we make big technical decisions?” The lead architect, who had the formal authority to make big technical decisions on his own, had instead chosen to invite 20 senior developers and architects and to consensually determine a set of operating rules for the department. A one-day workshop in February 2018 for all product managers to define and prioritize strategic objectives for the fiscal year, and to formulate action plans for moving those objectives forward. A one-day workshop in April 2018 for all product managers to align their product roadmaps around the previously identified strategic objectives, identify dependencies, and confirm feasibility. From the beginning, it became clear that not everyone was in love with Agile, not everyone agreed on everything, and not all teams were in a healthy place. We resolved some of that with added clarity and continuous communication. In addition, it was important to make sure everyone was heard, particularly by making it safe to voice disagreements and taking all concerns seriously. We maximized the opportunities to accustom teams to making decisions with consensus, rather than waiting for a senior person’s ruling. Our department has been seeing increased flow and ease of change. Most teams execute in a reliable fashion, turning out valuable results without major delays and deploying them forthwith. Since we value people and culture more than process, teams have full liberty to design their processes, and no two teams work identically. All teams enjoy the support of a dedicated team lead, who helps the team grow and thrive, increase Agile behaviours, and prevent small problems from becoming big problems. Several years ago, Digital Products started issuing a quarterly Staff Engagement Survey based on the Gallup Q12 employee engagement assessment tool. Survey questions are scored on a scale of 1 (lowest) to 5 (highest). The average response rate has always been 75-80%. After each survey, management reviews the scores with an eye toward increasing engagement. Q3: At work, do I have the opportunity to do what I do best every day? Q7: At work, do my opinions seem to count? Q8: Does the mission/purpose of my company make me feel my job is important? Q11: In the last six months, has someone at work talked to me about my progress? Q12: This last year, have I had opportunities at work to learn and grow? With every survey, we look at each question’s scores and their average. The scores have followed a normal distribution, except for some questions in pre-2016 surveys, and have ranged from 3.1 to 4.0. Comparing the average scores for each of those five questions from April 2016 to June 2018, we note significant improvements in all questions. Since the distribution of each question’s scores is now consistently bell-shaped, we understand that the entire department, as a system, has been both stabilized and “lifted” as a result of our efforts. The improvement is also notable in light of the department’s 20% turnover and additional 20% growth since 2016, which indicates that new employees are benefitting from the attention to engagement. In addition, we’re seeing a clear rise in morale, confidence, and team engagement whereas prior to this part of our Agile journey, interactions were dysfunctional and cynicism was rife. Another indication of an increase in positive engagement is our job fair. To fulfill our quick growth needs, the department held a job fair in June 2017. Contrary to management’s expectations, about 60% of our employees voluntarily contributed their evening to staff team booths and communicate with job seekers. Previous attempts at arranging similar events were met with low engagement, cynicism, and disinterest. From the beginning of our work with Gil, the quality of meetings and other team interactions has gradually improved. All meetings now have clearly stated objectives, participatory processes, someone designing and owning the participatory process, and a sense of safety for the attendees. People have explicit permission to walk out of meetings that do not have these qualities. As a result, meetings are generally effective and productive, engagement is higher, and collaboration is better. As challenges arise, affected parties work on them collaboratively. Initially, interactions improved within teams. As more department-level workshops were held, staff received further evidence of management’s commitment to engaging and hearing everyone. Earlier cynicism (“Just tell me what to do”, “You’re management, why are you asking me to decide”) was replaced with interest in participation, and the culture has a more cohesive and welcoming feel. Cross-team collaboration, although far from perfect, faces fewer barriers now. People at all levels are contributing more to the development of their products and their teams beyond their nominal job description. An impressive example of this is our recent, first-ever Innovation Sprint – a two-week period during which all “business-as-usual” work was set aside and the department focused on innovative ideas put forward by anyone in the department. Individual contributors pitched 27 different ideas, and teams formed around these pitches purely through self-selection. For the duration of the Innovation Sprint, these ad-hoc teams organized their work and interactions entirely without the usual “leadership” component in place. This type of self-organization has rippled through the department. Delivery teams are more vocal and engaged, whereas previously their product manager and ScrumMaster did most of the talking and decision-making. Teams conduct effective daily standup meetings with or without their ATL or product manager present. The daily Integrated Standup held between technical representatives of each team is completely self-organized and happens without fail. Following are quotes from people in the department, holding different roles and having different levels of seniority. The whole department, now over 120 people, has been positively affected by making collaboration part of the culture. The person who headed Digital Products during most of the period described here has since been promoted and now has a mandate to bring similar changes to non-software parts of the organization. Every few months, managers from those departments approach us to help them increase their agility. We’re clearly not “done” becoming Agile. We keep growing and improving, and continue to rely on Gil’s one-day-a-month visits for feedback, leading-edge ideas, and coaching for advanced Agile challenges.